We published the first version of this report, covering 16 beacon manufacturers in November, 2014. This version covers 10 new vendors with updated experiments and findings. In this report we examine 26 different iBeacon hardware vendors, including Estimote, Kontakt, and Gimbal. Over the past nine months, we have stress tested the beacons under many conditions examining every aspect of them. This is the most comprehensive report of its kind, covering every major beacon manufacturer, and providing an independent benchmark of each. Apple announced iBeacon technology to help smartphones identify their position and location in indoor spaces. The technology is based on the standard Bluetooth Low Energy (BLE) protocol, and is supported on all major smartphones including both Android and iPhone. iBeacon refers to tiny battery powered devices which emit Bluetooth LE signals. The iBeacons, or just beacons, transmit a unique signal multiple times every second which can be received by phones within a few meter radius. Phones can accurately position themselves by receiving signals from all nearby beacons. The mechanism is very similar to how ships used to use lighthouses – the lighthouse would emit light which was picked up by passing by ships. Unlike GPS, beacons can be used for accurate positioning indoors. Numerous applications have emerged – including indoor navigation, location based marketing, location based customer service, clienteling, and personalized assistance. Since the beacons use standard Bluetooth LE, it is supported well on both Android and iOS. As the name suggests, the Low Energy variant of Bluetooth is extremely power efficient. In our previous report, we examined the impact of beacons on both iPhone and Android. Under real-life scenarios,a phone’s battery drain should be less than 1% because of nearby beacons. In this report, we examine battery life of beacons themselves. Beacons have been gaining popularity recently. Numerous beacons exist in the market. The majority of them are powered by battery. 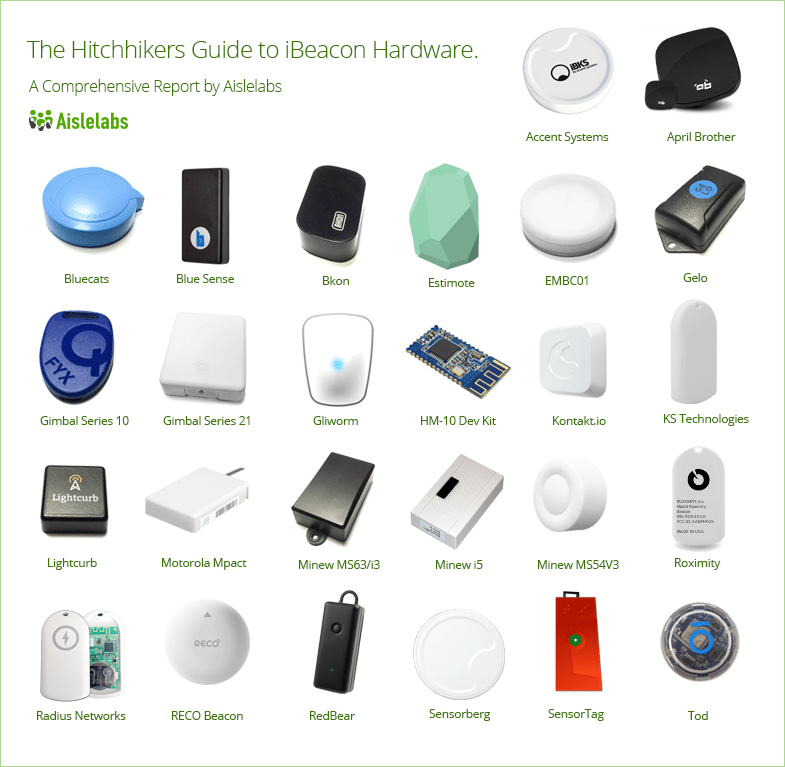 In this report we present the first comprehensive comparison of various beacon hardware available in the market. Beacons come in all form and shapes, with diverse chipsets, battery sizes and firmware. We have stress tested beacons from 26 different vendors over past nine months, examining every aspect of them under different conditions. In our previous report, we compared the impact on the phone battery (link), in this report we compare the beacons themselves across different parameters. Battery consumption behavior of beacons is very important, especially when deploying them in a large enterprise setting. With thousands of beacons in field, monitoring for their battery levels and replacing them as battery drains can be a significant undertaking. It is therefore desirable to use beacons with longer battery life. Beacons are small battery powered devices. They emit a BLE signal. The signal is picked up by the phone, and often transmitted to a cloud server via the internet. The backend cloud server processes the information and performs further analysis guiding specific location based behaviors in the mobile device. The hardware consists of a microcontroller with a Bluetooth LE radio chip and a battery. New radio chips are optimized for Bluetooth LE, whereas older versions were designed for Bluetooth Classic which had higher power consumption. The radio chip is commonly manufactured by two major companies: 1) Texas Instruments and 2) Nordic Semiconductor. Companies such as BlueGiga and Gimbal use the underlying hardware from Texas Instruments (TI) but with their custom firmware before selling them to beacon vendors. Coin cell batteries are the most popular choice for most beacons. These batteries are dense Lithium Ion cells and provide up-to 1,000 mAh of stored power in a very small form factor. Commonly available coin cell sizes are 240 mAh (CR2032, small size), 620 mAh (CR2450, medium size) and 1,000 mAh (CR2477, large size). Coin cell batteries are otherwise commonly used in key fobs and digital watches. Some beacons also use Alkaline AA batteries, which are commonly used in digital cameras and TV remotes. A typical AA battery provides around 2,000 mAh power but at a significantly larger size than coin cell batteries. Lastly, some beacons are externally powered. They can be installed in a wall outlet or a USB outlet. These beacons don’t need battery replacement and can be economical in certain situations. However, availability of a power outlet, without running new wiring, at exact spots where a beacon is required may not always be feasible. In this report, we focus on battery powered beacons only. Transmit Power (tx power): Beacon devices transmit a signal with a fixed base power, known as the tx power. As the signal travels in air, the received signal strength decreases with distance from the beacon. Higher tx power means, the signal can travel longer distances. Lower tx power means, less battery consumption but also smaller range. Advertising Interval: The rate (frequency) that a beacon emits a signal is its advertising interval. An interval of 100ms means the signal is emitted every 100 milliseconds (or 10 times in a single second). A higher interval of 500 ms means the signal is emitted only twice per second, which means less battery drain for the beacon. As the advertising interval increases, the battery life of the beacon also increases, but the responsiveness of the phone decreases. There is no optimal choice of advertising intervals, and applications needing low latency should choose lower advertising intervals, and those needing higher battery life should increase the advertising interval. Apple’s official specification for the iBeacon protocol specifies an advertising interval of 100ms. However, most beacon vendors opt for a higher advertising interval while still adhering to all other aspects of the protocol. In this report, we continue to use the term iBeacon for hardware that follows the packet format specified by Apple, but not necessarily the advertisement interval requirement. In most practical scenarios, an advertising interval much higher than 100ms is more than sufficient for a good user experience. Each beacon provides its own way of configuring the hardware and associated parameters (tx power and advertising interval). Some beacons, such as Kontakt, Estimote, RadBeacon and BlueSense Networks, provide their own proprietary iPhone app to configure the beacons. Other beacons, such as Minew, provide open interface via any GATT client (such as LightBlue iPhone app or gattool on Linux). The main advantage of beacons supporting GATT method is that hundreds of beacons can be configured at once. Some beacon hardware, such as Gimbal, also support their own proprietary beacon modes other than Apple’s iBeacon protocol. In this report, we only analyze the iBeacon mode of operation. Beacons provide the Bluetooth LE signal that is crucial for phones to position themselves. But these signals mean little without having an intelligent backend service. Typically, a cloud based application backed parses all received beacon signals and takes actions, acting as the brain behind all operations. Aislelabs’ Engage platform provides an intelligent cloud infrastructure which can be used by any mobile app. Aislelabs platform also provides an enterprise-grade beacon deployment and management layer. Security and protection against beacon spoofing is also handled by the Aislelabs cloud infrastructure. We do not manufacture beacons, but work with most beacons available in the market, providing the intelligent cloud software layer to use them in large deployments. In this report, we do not compare different cloud providers, and focus on the beacon hardware only. Beacons have to be integrated into mobile applications so they can communicate with the cloud server, receive actions and drive location based behavior. Aislelabs provides cross platform mobile SDK that works with any type of beacon and beacon hardware in the same secure and energy efficient way. See our previous report for typical energy consumption on phones. In this report, we focus on beacon’s battery life which is independent of the mobile SDK used. In order to accurately measure battery life of each beacon, we placed each beacon configured with different settings in our lab for past 3-9 months. Over the nine month period, we regularly measured the battery level (starting at 100% and decreasing over time). We also measured the current draw, in milliamperes, for each beacon. 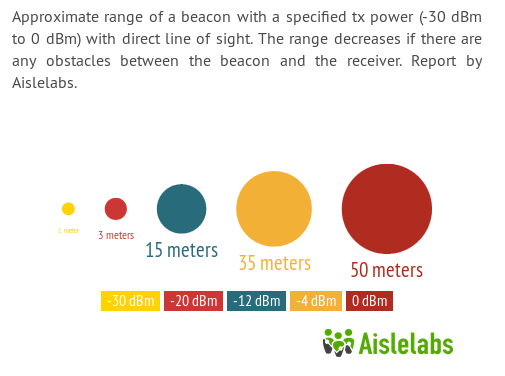 We experimented beacons with different configuration of tx power and advertising intervals. Each beacon has its own default values, in order to compare them all, we set them to a tx power of -12 dBmW and an advertising interval of 645 ms, which we refer to as Optimized iBeacon Settings. Since many beacons have a battery life longer than 9 months, we used the current draw to extrapolate the life beyond our experimentation period. One way to do this is to divide the battery capacity (say 620 mAh) with the current draw to get the time for complete battery drain. This assumes ideal battery, which constantly provides the said current till discharge — something that is not completely true of most Lithium Ion batteries. In real-life, the battery efficiency depends on the quality of battery among other factors. Since different beacons ship with different batteries, some good and some not-so-good, the actual life is difficult to predict. The battery life numbers reported below should be considered as the theoretical maximum, with actual life lower than the numbers below. Standardized Battery Life: We estimated the battery life of each beacon with Optimized iBeacon Settings and methodology above, which we report as the Standardized Battery Life. This metric provides a common way to compare all beacons side by side. We focus on four primary chipsets: Texas Instruments’ TI CC254x, Nordic Semiconductor’s nRF51822, Bluegiga’s BLE112 / BLE113, and lastly Gimbal’s proprietary controller. While there are other compatible chipsets, the above mentioned have over 95% of the market share at the time of this writing. In this section we provide a detailed experimental study of battery consumption and power draw when using the chipsets in iBeacon mode. Chipsets from TI, Nordic and Bluegiga support different configurations for tx power and advertising interval. Gimbal provides an additional layer of Bluetooth MAC randomization, not available in other chipsets, which comes at the cost of battery drain. Gimbal beacons support only a limited set of configurations and the advertising interval can not be changed freely. For each chipset, we summarize battery life for iBeacon Optimized Settings of 645ms advertising interval and -12dBm tx power (15 meters) using the small CR2032 coin cell battery. For Gimbal, since it locks advertising interval to 100ms in iBeacon mode, the numbers reported below for Gimbal are not directly comparable with other chipsets. Among the four chipsets the two most prevalent chipsets are TI and Nordic. The TI chipset first became available in 2009, whereas Nordic chipset was introduced in 2012. Given this, it is reasonable to expect the Nordic chip to be more optimized for beacon-related use cases. Gimbal chipset also provides a propitiatory beacon mode, other than iBeacon protocol by Apple, but we consider only the iBeacon mode for experiments in this report. We expect these vendors to update their chipsets with newer more optimized radios in near future. IKBS 102 beacons are designed by Spanish company Accent Systems. These beacons come with Texas Instruments chipset and are powered by 1000 mAh, CR2477 coin cell battery. Technical specifications at manufacturer website. AprilBeacon 241 beacons are designed by Chinese company April Brother. These beacons come with Texas Instruments chipset and are powered by 620 mAh, CR2450 coin cell battery. Larger beacons with two AAA batteries are available, which should provide longer life of approximately 32 months. Nashville based BKON manufactures the A1 beacons. These beacons, equipped with 2 AAA batteries provide ample battery life. The beacons also support an alternate UriBeacon protocol to iBeacon. Bluecats AA beacons use a Bluegiga chip with 2 AA batteries. BlueBar beacons are designed by UK-based company BlueSense Networks. These beacons come with Bluegiga BLE113 chipset and are powered by 620 mAh, CR2450 coin cell battery. EM Microelectronic is a Switzerland based semiconductor manufacturer specialized in ultra low power battery-operated applications. The EMBC01 beacons employ chipset made by the company and do not use the popular Texas Instruments, Nordic Semiconductors or BlueGiga chipsets. The company is owned by the Swiss watch giant, The Swatch Group. The polish startup Estimote is one of the better known beacon hardware manufacturers with slick looking beacons in a colorful silicon case. The company is now headquartered in San Francisco after graduating from Y-combinator and raising venture capital from Silicon Valley investors. These beacons come with Nordic Semiconductor’s NF51822 chipset. In our previous report we tested the first batch of Estimotes which came with a 620 mAh, CR2450 coin cell battery. Starting October 2014, Estimote is shipping updated beacons with larger 1,000 mAh batteries which increases the battery life. The beacons are completely enclosed and can be used in outdoor environment with some moisture, but this means the battery can not be replaced — new beacons has to be purchased when the battery runs out. With the flexible silicon cover, a selection of bright colors, and reusable adhesive the Estimote beacons stand out as the most stylish among all beacons available in the market today. The company also introduced thin Estimote Stickers recently (only 3 mm deep, but with a smaller battery). Estimote also has been releasing updates to their firmware to further improve battery life (see our previous version of this report for comparative experiments). Estimote beacons are configured via a proprietary iPhone app. Technical specifications for the beacon at manufacturer website. Tables below show the battery life comparisons for firmware version 2.2 on Estimotes with 1,000 mAh battery. Note that the reported numbers below assume an ideal battery, which is not the case for real-life batteries and actual life may be lower than the numbers below. Water, weather proof rugged beacons from Michigan based company. Technical specifications for the Gelo beacon at manufacturer website. Qualcomm, the American semiconductor company better known for making Snapdragon processors, spinned off its beacon division as Gimbal earlier this year. With Qualcomm’s reputation behind it, the new company has released beacons in different form factors including Gimbal Series 10 with a small battery and Series 21 with larger 4 AA batteries. Gimbal beacons support two modes of operation: the Apple standard iBeacon mode and a proprietary mode. These beacons are the only beacons that change their source Bluetooth address frequently to provide a hardware layer of spoof-protection. With the spoof protection, it is very difficult for an evesdropper to know the details of the beacon or to clone the beacon. If such a functionality is not available in the beacon hardware, the app developer will need to utilize software-based mechanisms to counter adverse effects of knowing the beacon details. Hence, Gimbal provides an excellent option when software-based spoof mitigation is not available. Gimbal provides high quality beacons with stable signals, but falls short in terms of battery life and larger form factor. Several vendors in the market provide much longer battery life in a smaller form factor by allowing the user to configure advertising interval and other parameters more freely. Technical specifications for the Gimbal beacon at manufacturer website. Tables below show the battery life of series 21 beacons in both iBeacon and Gimbal proprietary mode (Series 21 recommended mode) in number of months. Table shows the advertising interval and transmit power as the two variables as determinants of the battery life. Glimworm beacons are designed by the Dutch company, Glimworm. These beacons come with a Texas Instruments chipset and are powered by a 620 mAh, CR2450 coin cell battery. Technical specifications for the Glimworm beacon at manufacturer website. HM-10 is a Serial UART bridge which also has iBeacon capability. This module is designed for the developers as a prototype kit. The brains behind these beacons are Polish company Kontakt.io. Kontakt started out initially as a company offering a solution to aid the visually impaired navigate public spaces and enhance overall experience. Today, their beacons aim to help people from all walks of life have enriched experiences while leveraging their beacon technology. These beacons come with a Nordic chipset and are powered by a 1000 mAh, CR2477 coin cell battery. Based on our tests we’ve found the product architecture to work quite well with this chipset, with accurate and extensive range transmission and significant power optimization. The beacons can be configured via Kontakt’s own proprietary application as well as support for open standards that allow for seamless 3rd party integration. The ease of use of Kontatk’s configuration system makes it easy to deploy these beacons in large quantities. Technical specifications for the Kontakt beacon at manufacturer website. Table below shows the advertising interval and transmit power as the two variables as determinants of the battery life (in months). Maximum battery life is 35.7 months when the beacon advertises every 900ms at power level -20 dbmw, with the same falling to only 4.5 months under most aggressive settings. These beacons are designed by the American company, KST(KS Technologies). KST sell their beacon hardware under a brand known as Particle. They come with a Nordic chipset and are powered by a 240 mAh, CR2032 coin cell battery. The simplicity in design makes these beacons easily customizable to fit a reseller’s exact particular requirement (firmware or hardware). KST, acting as an OEM, offer a service whereby they are able to white label with another company’s logo and even go as far as register the newly branded device with the FCC, IC and CE. Technical specifications for the KStechnologies beacon at manufacturer website. Lightcurb beacons provide adequate battery life and are powered by Nordic chipset. The Minew beacons are designed by the Chinese company: Shenzhen Minew Technologies. These beacons come in different variations. We tested three variants of the beacons: MS54V3 with a CR 2477 battery, i5 with two CR 2477 batteries and MS63/i3 with two AA batteries. Other variant of the same beacons is MS56 which we did not report results on as it is similar to MS54V3 but with a soft silicon soft shell for outdoor environments. All beacons use the same Texas Instruments chipset with same firmware, with battery being the only difference. Chart below shows battery life of MS54V3 in months under different configurations. The battery life of i3 and i5 beacons will be about twice that of MS54V3. Table below shows the ideal battery life (in months) as a function of transmit power (in dbmw) and advertising interval (in ms) for the beacon. Technical specifications for the Minew beacon at manufacturer website. Table below shows the ideal battery life (in months) as a function of transmit power (in dbmw) and advertising interval (in ms) for the beacon. Note, at the time of testing, beacons did not allow changing the advertising interval to a value other than 100ms (which is recommended by Apple). However since than, the MPact beacons can be used in iBeacon mode with 600ms advertising interval to provide battery life up-to 12 months. MPact provides a beacon management platform alongside the hardware beacons. The company also develops Wi-Fi access points and combines all location based services under the MPact umbrella. Since MPact is one of the few vendors that provides solutions beyond just Bluetooth beacons, we have selected this platform as Enterprise Ready, in this report. Other vendors with offerings spanning enterprise solutions beyond just beacons are Meraki and Aruba, which we plan to stress test in the next version of this report. Radius Networks are an American company that make the RadBeacon Tag. These beacons come with a Nordic chipset and are powered by a by a 240 mAh, CR2032 coin cell battery. While the RadBeacon Tag we tested worked with the CR2032 coin cell battery, Radius Networks offers a different flavor of this beacon in a USB powered variant known as the RadBeacon USB. The benefit of having a USB powered beacon is that replacing the battery becomes a non issue so long as the USB supply powering the beacon is on and functioning. However, it should be noted that this variant can be harder to deploy in a large scale environment due to the challenges of provisioning power outlets at exact spots where the beacon is needed. These beacons are designed by the South Korean company, RECO. The beacons come with a Nordic chipset and are powered by 620 mAh, CR2450 coin cell battery. These beacons are designed by Chinese company, RedBearLab. The beacons come with a Texas Instruments chipset and are powered by 2 AAA(TripleA) batteries equaling 2000 mAh. These beacons are designed by American company, Roximity. The beacons come with a Nordic chipset and are powered by a 240 mAh, CR2032 coin cell battery. These beacons are designed by German company, Sensorberg. The beacons come with a Texas Instruments chipset and are powered by a 620 mAh, CR2450 coin cell battery. These beacons are designed by American company Texas Instruments. The beacons, naturally, come with their own company crafted TI chipset and are powered by a 240 mAh, CR2032 coin cell battery. These beacons are designed by American company , tōd LLC. The beacons come with a Bluegiga chipset and are powered by a 240 mAh, CR2032 coin cell battery. A comparison of battery life across all beacons is shown in the chart below, which shows the battery life of each beacon in months (higher is better). Note, some beacons such as Gimbal and MPact do not allow changing the advertising frequency and hence battery life numbers for them are not directly comparable. Aislelabs provides an intelligent cloud platform for personalized, real-time in-store analytics and engagement. The SaaS product suite of the company includes: 1) advanced analytics solution to measure footfall traffic and consumer behavior inside and outside physical stores, similar to web analytics for e-commerce, and 2) a mobile marketing automation and engagement platform to deliver effective personalized experience. The company serves several verticals including airports, hospitality, retail and financial services. Aislelabs’ products, Engage and Pass, utilize the iBeacon technology to create hyper-local experiences. Aislelabs platform works with most major beacon hardware vendors while enabling secure beacon operation and spoof-protection via a unique patent-pending technology. The platform consists of enterprise-grade scalable beacon deployment and management platform along with intelligent cloud infrastructure for automated multi-step campaigns. This work by Aislelabs is licensed under a Creative Commons Attribution 4.0 International License.